Sweet Saturday! Open 10 AM – 12 noon on the South Shore. Lots of goodies, despite the dry dry weather: Sweet salad mix, spicy salad mix, baby spicy salad mix, baby arugula, microgreens, kale, collards, mustard greens, large bunched arugula, radicchio, dandelion greens, Chinese cabbage, broccoli, broccoli leaves, Bodhi beans, carrots, beets, onions, fresh ginger root, cilantro, Italian basil, Thai basil, lemon basil, holy basil, dill, garlic chives, recao, epazote, mint, thyme, sage, rosemary, lemongrass, fennel, figs, cherry tomatoes, heirloom tomatoes, slicer tomatoes, pineapples, passionfruit, sweet corn, lettuce heads. We will also have vegan coconut-based ice cream from I-Sha, raw local honey from the Jolly Hill Apiary, and fresh local eggs, from Marti Gotts. 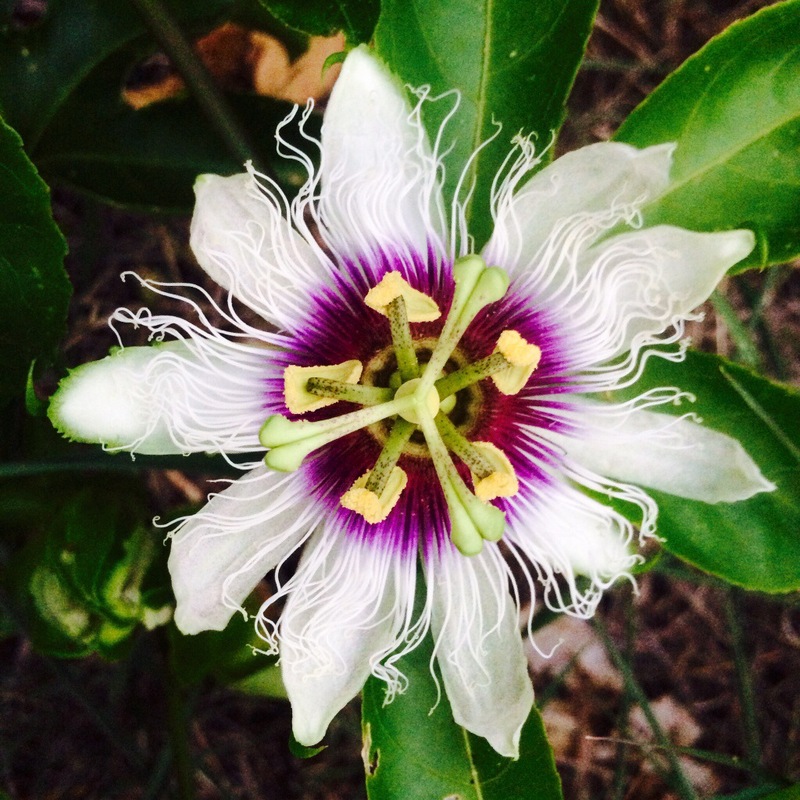 Lots of things are flowering (including our passionfruit vines) and the bees are going crazy! An eco-friendly way to get rid of a swarm of bees that are not desired in your home or yard is to call a beekeeper. They have special equipment and can remove the swarm safely to another location where they will happily continue to pollinate plants and make our world a sweeter and greener place. Purchase local honey, and you’ll always have the phone number of a nearby beekeeper right in your kitchen! Due to an entirely avoidable human error combined with incredibly sophisticated technology, today’s post did not go out until four minutes before we closed. Our apologies for any inconvenience. We will have a lot of the same stuff on Wednesday, if you missed us today. With all the fantastic rain and blooming flowers and growth it is swarming season for bees that have outgrown their hives. A swarm in May is worth a bale of hay. A swarm in July isn’t worth a fly. This morning the same smallish group of 20-30 bees was spotted scoping out a space above the back kitchen door of one of the historical buildings on the property. Within ten minutes, a deafening hum could be heard as literally thousands of bees descended and began moving into a 1/2 inch crack near a roof beam at the same location. Christina called our beekeeper, Wanda of Wright Apiary, for assistance and the two ladies donned bee suits and were able to pry up a small piece of plywood covering the hollow space in the roof structure, and gently vacuum the extremely large and healthy swarm out of the inside of the roof and into two small cages using special beekeeping tools. A bit of smoke from a hive smoker along a crack in the wall encouraged most of the rest of the bees to come back out from the deep recesses of the roof structure. About halfway through the removal process Wanda was skilled enough to spot the large queen and capture her in a special queen box. Wanda installed the queen, in her cage, into a temporary small hive box and we began the process of gently shaking and brushing pounds and pounds of buzzing bees from the now heavy small cages into the small hive box. 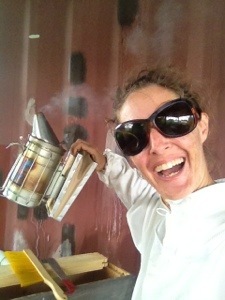 Lastly, Wanda placed a bit of bee food in the hive box to help them feel invested in their new location. The hive box will remain near the hole in the roof for a few days until the rest of the bees have found their queen. Then we’ll move them into a larger hive box with a comb or two of ‘brood comb’ where the queen, once released from her cage, can immediately start laying her eggs. This should encourage the bees to stay in the new hive, even though it wasn’t their first choice. If you spot bees swarming around your yard or home, don’t panic. 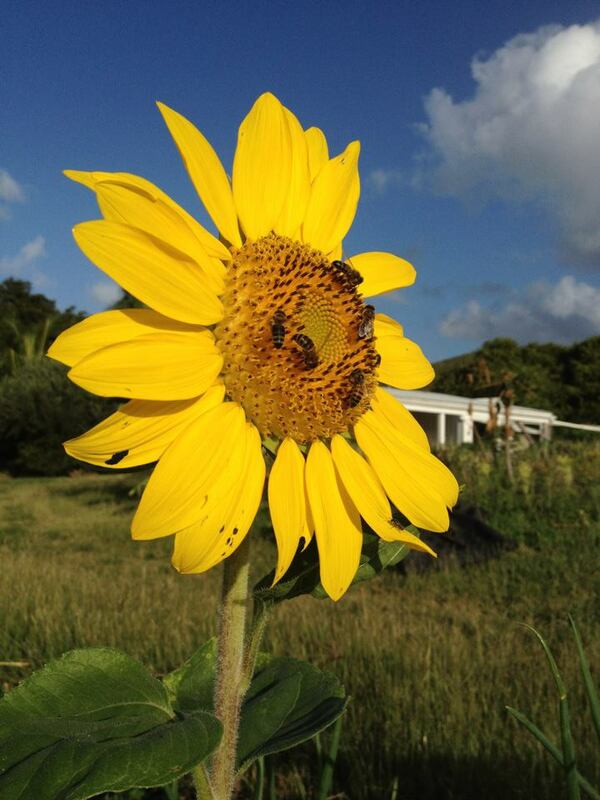 Bees that are out and about looking for a place to live are focussed on the move and are not looking to sting people. A large swarm hanging off a tree can look like an odd, dark colored termite nest. 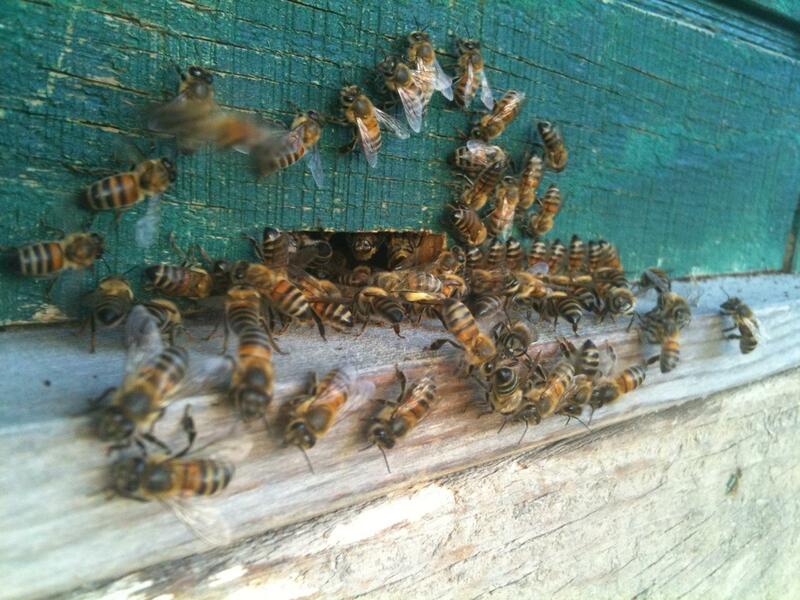 It’s thousands of bees surrounding their queen, awaiting directions from the scouting party. Keep a comfortable distance and be careful not to disturb the swarm, but feel free to observe them. They’re only in an exposed area like that briefly, and will be gone within hours or a day or two at most, as soon as their scouting party finds the perfect new hollow spot. To prevent a swarm of bees from moving into structures, patch up or caulk up cracks. Bees can move into hollow spaces with just a 1/4″ opening available to them. If bees do move into a structure, you can call 911 for assistance and they’ll direct you to a local beekeeper who can remove (or exterminate) the hive using specialized tools, protective clothing and equipment. Come Rain or Come Shine – We’re OPEN!! 10am – 12 noon! Phooey to the rain. 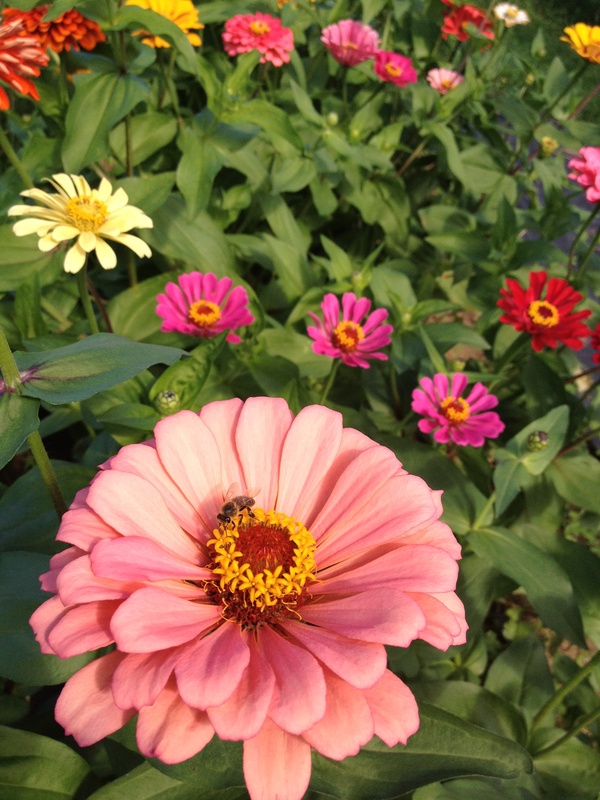 The farmstand is OPEN today, Saturday May 21st! See you between 10am and noon! We have gorgeous baby and micro greens, baby arugula, sweet and spicy salad mixes, cooking greens galore including kale, broccoli rabe, baby collards; fresh herbs including dill, basil (lemon, thai and italian), parsley, garlic chives, lemongrass; honey and honey vinegar; two types of hot peppers, cucumbers, pumpkin, cherry tomatoes, scallions; mangoes, pineapple and local short fat “Blue Java Ice Cream” bananas. Speaking of ice cream, of course we have Feel I’s coconut based non-dairy local fruit ice creams and four flavors of Sweetface chocolates. Last night’s steady rain that continues this morning brings us to thirteen inches since Friday May 13th. Water is running all over the farm, our lined catchment and runoff ponds are completely full, our native trees have gone without a hand watering for a week, the weeds are tremendous, and our galoshes and umbrellas are in heavy rotation. We managed to mow and weedwack a path of sanity in our customer parking and farmstand areas, so fear not the undergrowth. Yesterday afternoon despite a persistent drizzle, our bees were busy flying in and out of the hive. Do exercise caution and go slow while driving in flash flood conditions! VITEMA reported road closings last night at Five Corners heading up to Little Princess Hill, and at Peters Rest Road near Junie’s Bar, so find alternate routes. We can umbrella you to and from your car once you get here, if you’ve forgotten yours, so please give us a call from the parking lot! (340)514-4873.